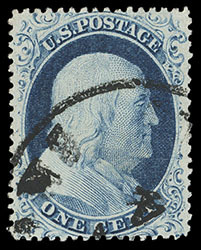 1861, 1¢ blue, type I, full o.g., deep color and wide margins showing full scrolls at bottom, F.-V.F. 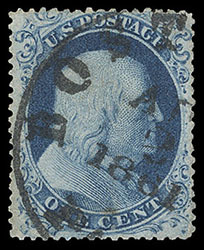 1861, 1¢ blue, type I, neat grid cancel, well centered amid wide margins, strong crisp impression and bright color, Very Fine and choice; with 1998 P.F. certificate. 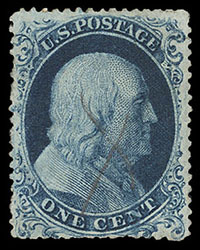 1857, 1¢ blue, type Ia, manuscript pencil cancel, deep rich color, well centered clearly showing wide break at top, small light corner crease at bottom right, F.-V.F. appearance; with photocopy of 1981 P.F. certificate. Scott No. 19 $4,000 for pen cancel. 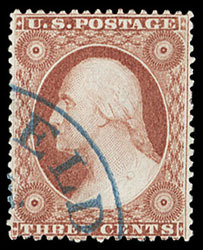 1857, 1¢ blue, type IIIa, o.g., rich color and attractive centering, few slightly short perfs at right not mentioned on certificate, Very Fine; with 1998 P.S.E. certificate. 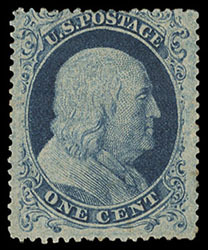 1857, 1¢ blue, type IIIa, plate 11, Boston April 1861 year date town cancel, well centered, rich bright color, Very Fine and choice; with 1996 P.S.E. certificate. 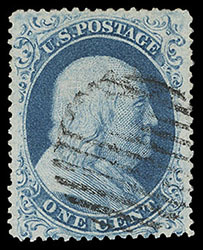 1857, 1¢ blue, type IV, town cancel, exceptional centering, rich bright color and a crisp detailed impression, an Extremely Fine gem; with 1992 P.F. & 2003 P.S.E. certificates. 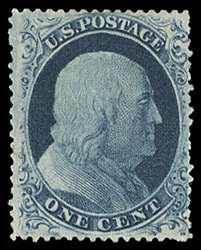 1857, 1¢ blue, type V, o.g., lightly hinged, rich bright color, precision centering, Extremely Fine and choice. 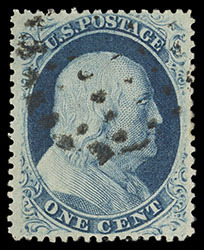 1857, 1¢ blue, type Va, plate 5, light grid of dots cancel, choice centering, rich bold color, Extremely Fine, a tough stamp so nice; with 1978, 1993 P.F. & 2004 P.S.E. certificates, the latter Graded (XF 90). Scott No. 24 var. $300. 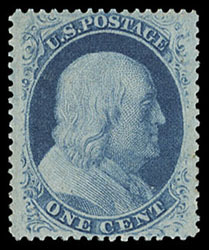 1857, 3¢ rose, type I, neat blue town cancel, rich vibrant color and choice centering for this tight margin issue, Extremely Fine and attractive, a striking used stamp; with 2004 P.F. certificate. 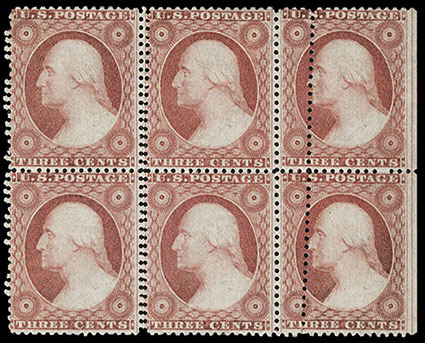 1857, 3¢ dull red, type III, right margin block of 4 with plate guideline, full o.g., showing extra vertical perfs in right block, hint of oxidation, Very Fine, a very scarce double perf variety, especially so in a mint multiple; with photocopy of 2007 Weiss attest. Scott No. 26 $580 for normal.